Astronomers have found evidence for what they believe to be the youngest black hole existing in our cosmic neighborhood. 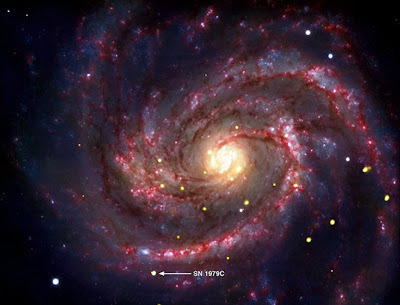 The supernova that gave birth to the black hole was first discovered in April 1979 by a teacher moonlighting as an amateur astronomer and astronomers have been observing the area since then. There is a chance that the supernova has morphed into a dense neutron star instead of a black hole. Researchers are expressing confidence that it is a black hole, however, because for a 12-year period from 1995 to 2007, it emitted X-ray radiation at a constant rate. The amount of radiation emitted from neutron stars would be expected to taper off over time, while a black hole's radiation would remain constant thanks to its steady diet of stellar material. Though in cosmic terms it is close by, calling the black hole our neighbor is relative. Our Sun is less than a millionth of a light-year away from Earth, an insignificant distance compared to the 50 million light-years stretching between the Earth and Virgo. It is believed the black hole formed from a star whose original mass was 20 times that of the Sun. Now, the dense black hole looks like it is packing material with a mass about 5 times that of the Sun into an area less than 25 miles across. In the photograph above, data from the Chandra X-ray telescope is dyed gold. Visible light data from the European Southern Observatory's Very Large Telescope is dyed red, green and blue. Infrared imagery from NASA's Spitzer Space Telescope is also dyed red. The find is significant because it will give astronomers the chance to study a black hole (or a neutron star) from near-infancy. Scientists can follow the progress of the supernova's afterlife to help determine why some supernovas form black holes and others produce neutron stars. i cant see this being any problem, there are black holes all over the universe and none pose a threat and no one has ever been anywhere near one to see what they actually do.